You can get help from our experienced QA team. 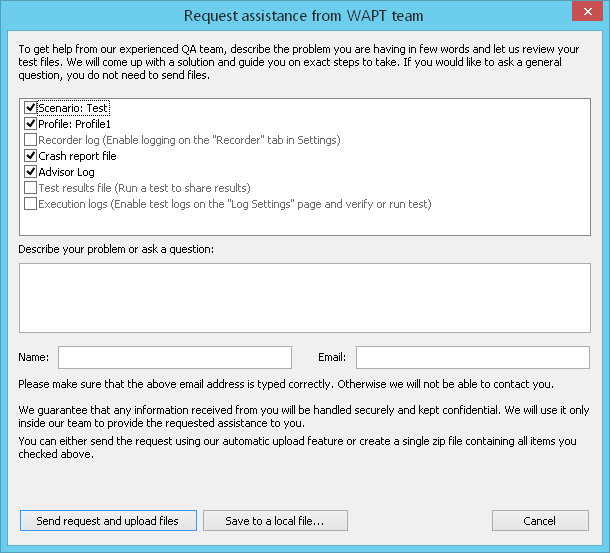 Click the Ask for Assistance button on the toolbar to initiate the assistance request dialog (you can also use the Ask for Assistance from WAPT Team... option on the Help menu). All files available for current scenario are automatically checked in the list above. Describe your problem or ask a question and enter the correct Email address. If you ask a general question and do not need to send files, just uncheck them in the list. Send request and upload files: Click this button to send the assistance request to WAPT team. All files checked above will be automatically uploaded and attached to the request. Save to a local file..: Using this button you can save all files checked above to a single zip file on a local machine or another computer in your LAN. In this case the assistance request is not sent automatically. You will need to send us the saved zip file manually (e.g. via Email).